When you have a small garden or perhaps an area to the side of your home that you would like to extend, it sometimes seems that a conservatory is not an option. However, we offer a range of lean-to conservatories to homes in Fleet, Hampshire, Farnham, parts of Berkshire, Camberley, Surrey, Aldershot, Basingstoke, Hook, Farnborough, Bagshot, Lightwater, Cove, Frimley, Yateley and surrounding areas that can enhance almost any space. Get a free quote on your new lean-to conservatory in Fleet and Hampshire. The lean-to conservatory, or Mediterranean conservatory as it is otherwise known, is the ideal choice for when space in your Fleet, Hampshire, Farnham, Camberley, Aldershot, Basingstoke, Hook, Farnborough, Bagshot, Lightwater, Cove, Frimley and Yateley home is limited. Designed to lean against the property rather than be an appendage from it, these high quality conservatories from Ultraframe can fit into almost any space available. They are particularly suited to homes with low roofs such as bungalows, as the height is less imposing than on other styles of conservatory. A Small space, however, does not mean a small room as the leant-to conservatory maximises the potential of any space available. You can use them for something as practical as a utility room, or for something as grand as a living area overlooking your garden. In addition to all this, these super conservatories create a light and airy space for you to enjoy. Natural light pours in from the outside, so when you need something that will cover a window, these are ideal, as your home will still benefit from the light available. The combination of high quality materials in the fabrication of our lean-to conservatories coupled with the secure locking mechanisms included as standard ensure that these Mediterranean conservatories meet the most impressive standards of home protection and provide superb security for you and your family. 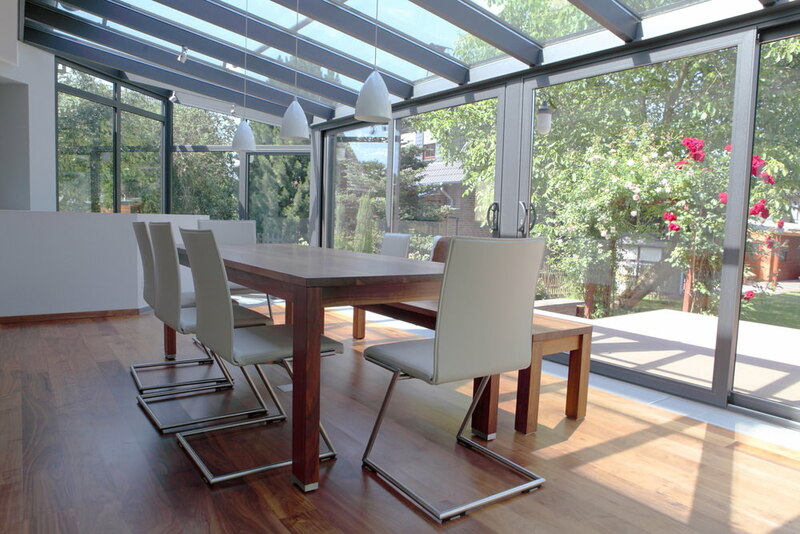 Despite not having the expanse of glass and brickwork associated with a traditional conservatory such as the Victorian conservatory, these lovely spaces still meet the same exceptional energy efficiency standards. The design incorporates cutting edge materials and construction techniques to ensure that there are no draughts and heat loss is minimised. The lean-to conservatory is generally rectangular, however, the versatile design means that they can be adapted to suit any area whatsoever. You can further style them to suit your tastes with an array of colours and glazing choices. The additional living space they create can be used for anything at all, and they are in fact popular as garden rooms where plants flourish in the bright atmosphere. Our entire range of double glazed products are underpinned by the same impressive 10 year fully insured guarantee. This comprehensive guarantee ensures that you have confidence in the quality and performance of your lean-to conservatory and that you know it will continue to provide outstanding service year after year. We offer exceptionally competitive prices on our lean-to conservatories in Fleet, Hampshire, Farnham, Camberley, Aldershot, Basingstoke, Hook, Farnborough, Bagshot, Lightwater, Cove, Frimley and Yateley. You can get a free, tailored quote from our online quote calculator. It is so simple to use and takes just a few minutes of your time, so give it a try!